Call for a FREE Quotation 07941 249296 - You Will be Glad You Did! 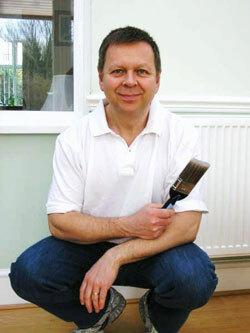 Hi, my name is John Lewis and I am a professional painter and decorator covering South East London and North Kent. See the links at the bottom of the page for all the areas I will travel to. With over ten years experience I specialise in painting, decorating and wallpapering private homes to a very high standard. The service I provide is professional, fast, friendly and reliable. Feel free to Contact me any time for a quote and my immediate personal attention. I work as a sole trader with no employees and so my overheads are low. The benefit in this to the client is that you get a very personal painting and decorating service at a reasonable price. It also means that I can assure you of my direct attention throughout the job from start to finish. I am a non smoker and will treat your home with the respect it deserves with all areas left clean and tidy at the end of each day. Need to find a decorator in London or Kent? I will provide decorating services in most areas of South East London and North Kent. So if you need a painter decorator in Bromley, Beckenham, Sevenoaks or Orpington or a house painter to decorate a single room or living area in Lewisham, Eltham or Welling or any other London area call me today. Call me now on 07941 249296 for a fast friendly response and a free no obligation quotation or use the Contact box where you can get in touch with me by email. When I start a new job I first work on the correct preparation of surfaces prior to decorating. This aspect is often neglected by many other decorators. I believe this work is essential and defines the difference between an average poor finish and a superior one. A professional fine finish is a hallmark of all my work whether it is the decoration of an entire house or just a single small room. A fantastic decorator with great attention to detail, John is one of those rare people who not only works hard but treats your home as if it was his own and is a pleasure to have around – we couldn’t be happier with the results and cant recommend him highly enough. I have used John for a number of small jobs like painting and finishing new doors and refreshing dirty and worn paintwork. His work, attitude and prices are always very good. Can’t fault him and will use him again no doubt! John was recommended to me by my neighbour and I am so glad they did. He is a good worker , reliable , thorough and trustworthy with a pleasant personality. I have no hesitation in recommending him to my friends. - Mrs R. Marchant , Bromley. John was great. He decorated my lounge and dining room to a very high standard and finished the job on time at a very reasonable price.I have already recommended him to friends and family. - Mrs M Strong , Orpington. This is the third time we have had John back to paint further rooms and we wouldn’t use anyone else. He always does a superb job , is reliable , trustworthy and always leaves things clean and tidy. - Mr. A Boffa , Walderslade. John has been decorating for our family for a few years now. He is very dependable and very reliable and I feel very confident that he will always do a first class job. Personally I would rather wait until John is available to work than choose someone who was inferior to him. My neighbours agree with me and are always singing his praises! He has a very sunny personality and engages well with people of all age groups. I would be happy to supply a personal reference to anyone who would like to contact me. - Mrs Jan Bolton, Bromley. John decorated the majority of our 3 bedroomed house. He has transformed the property which is now in pristine condition and ready to sell. During the fortnight he was here, John was professional, courteous and respectful. He will be our first choice to decorate our new home. - Mrs Cameron-Heslop, Orpington, Kent.